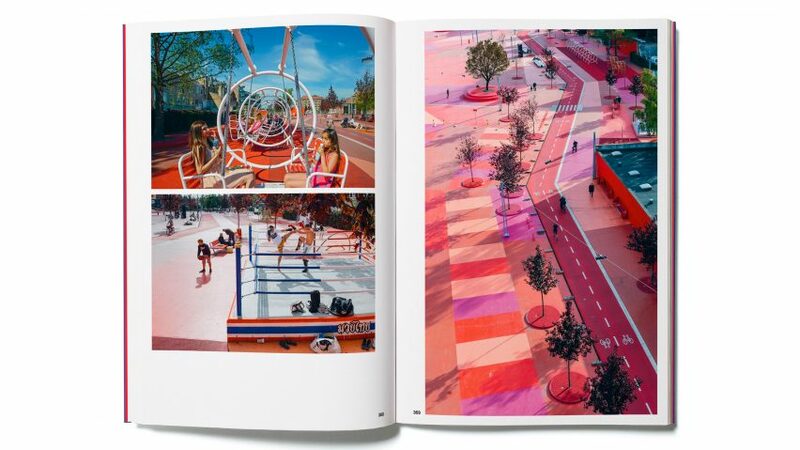 Dezeen has teamed up with landscape architecture firm Topotek 1 to give away a book showcasing its projects, including a colourful park in Copenhagen, bright pink street furniture and an assortment of sports fields. Titled Creative Infidelities: On the Landscape Architecture of Topotek 1, the book showcases ten of the studio's significant projects to mark its 20th anniversary. Congratulations to the winners! Jonathan Whit from the UK, Michael Bock from Germany, Diane Kenton from the UK, Paula Gagane from Latvia and Eva Kodouskova from the USA. One of the featured projects is the pink rubberised Superkilen park, which the landscape architects designed alongside Danish architecture firm BIG. Earlier this year, the project was awarded the Aga Khan Award for Architecture. Edited by Barber Steiner with graphic design by Rasmus Koch Studio, the book documents the studio's approaches and methods – offering readers a behind-the-scenes look into the process of landscape architecture design. It also features descriptions from Topotek 1's collaborators across the fields of architecture, art and design, including private and public clients, planners, project managers and contractors. The book's title pays tribute to Jorge Luis Borges, an Argentine short-story writer, essayist, poet and translator who Topotek 1 cites as a major influence. "Following Borges' idea that mistranslations and fragmentary translations allow for displacements and regional transpositions that enrich the original rather than diminish it, Topotek 1 deals with gestalt, forms and content in an open and liberating manner," said Topotek 1. Five readers will each receive one copy of the book, which is the result of a two-year collaboration between Topotek 1, editor Barbara Steiner and Copenhagen-based graphic designers Rasmus Koch Studio. It is produced by Jovis publishing.